Let’s be honest, these problems do exist. But these problems do not justify double-billing – charging the public healthcare system and patients as well for healthcare. They do not justify breaking Canadian laws that are meant to provide equity and protect patients from user fees when they are sick, elderly and least able to pay. And they do not justify charging two times, three times, five times or even more what the public system pays for healthcare services to seniors and patients when they are sick and in need. At the Ontario Health Coalition, we have been advocating for 10-years to stop the cuts and reinvest in our public hospitals. We have led this fight, which we know is overwhelmingly supported by the public. But in all these years of advocating to save and improve services in our public hospitals, the private clinic owners that are justifying their extra-billing of patients by complaining about access to operating room time have been nowhere in sight. They have not joined in the fight to save local hospitals from closure, I have not seen them advocating to improve public hospital funding, to build public capacity, nor to ensure that funding goes to care. For two decades, pro-privatization pundits, clinic owners and politicians claimed that it doesn’t matter if services are owned and controlled by for-profit entities or public and non-profit hospitals. Private clinics, they promised, would exist under Canada’s public medicare laws without causing harm. They would, on every occasion, avow that private clinics are beneficent and healthcare would not rely on your credit card. They were not telling the truth. Over the two decades or more in which Canadian provinces have experimented with privatization, the attempt to regulate private clinics has failed. Illegal billing, double-billing and quality problems have become widespread. The clinics are violating the laws of Canada and the provinces as a business model because doing so increases their (already substantial) incomes and profits. The evidence is indisputable. In 2008, we called every private clinic in Canada. 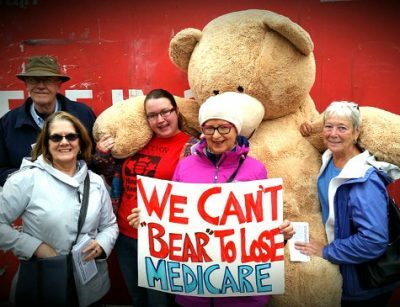 We researched and wrote a report Eroding Public Medicare: Lessons and Consequences of For-Profit Health Care Across Canada . In it, we published the notes from our calls with the private clinics, showing that the vast majority were violating the Canada Health Act. Again in 2014, we called all the private clinics in Ontario, and we found that the clinics continued to break Canada’s medicare laws. If anything, the majority of clinics had become more manipulative and unethical in the information that they were giving to patients to “sell-up” medically unnecessary add ons. Physicians, nurses and health professionals from Saskatchewan, Ontario and Quebec have organized themselves to ask governments to stop privatization on behalf of their patients. Almost half-a-million patients in Quebec filed a petition with the federal court to force the Health Minister to uphold Canada’s medicare laws and stop the burgeoning user fees charged at private clinics in that province. Now, we have released our latest surveysof 136 clinics and 400 patients that again proves that the transgressions are not the exception among private clinics… they are the rule and they are causing hardship for patients. Now that the private clinic owners are caught breaking the laws that they said they would not threaten, they want politicians to legalize their illegal activities and simply regulate extra-billing. So far, the record on regulation is abysmal. Private clinics are using failures in public policy as cover for their unethical behaviour. But their critique of what is happening in our public system is not entirely wrong. The solution is not to throw out public medicare and the protections against user fees and financial hardship that it affords to patients. The solution is to open unused capacity in our public operating rooms and diagnostic suites, use sound population planning processes to plan public hospital capacity to meet our communities’ needs, adopt innovations in wait time management and the organization of services to improve access, and roll contracts back in to our local public hospitals. Privatization is a failure. It’s time to rebuild capacity in our community hospitals that operate on a non-profit basis in the public interest and insist that our governments plan for and resource our public hospitals to provide the services we need. A special thank you to all of you who answered surveys and distributed them to your contacts. Together, I know that we can protect public healthcare, based on the principles of equity and compassion for all Canadians.